The entire site for the development plan shall be owned or controlled by the developer. No acreage proposed for planned residential development shall be located outside the municipal boundaries of Fox Chapel Borough. The site may be in the A, B or C District established by Part 1 of this chapter. Single-family detached PRD development shall be permitted in the A and B Districts only. Multifamily PRD development shall be permitted in the A, B and C Districts. The site shall not be smaller than 18 contiguous acres, all of which shall be located within the municipal boundaries of Fox Chapel Borough. The site must provide for direct access to and from an opened public road. A planned residential development may include single-family and/or multifamily dwellings, open space, incidental recreational facilities, and accessory uses and structures. Accessory uses and structures are uses and structures which are customarily accessory and clearly subordinate to permitted uses and structures. Maximum gross density of dwellings. Note: Rounded down to the nearest whole number. (20 acres - 3 acres) x 0.58 = 9.86; therefore, 9 permitted lots. It should be noted that the required open space is included in the number of total site acres, regardless of ownership. For example, if a five-acre area of undisturbed open space on a site is planned to be dedicated to the Borough, said five-acre area shall be considered part of the total site acres for purposes of calculating the permitted number of lots. As such, the amount of required undisturbed open space shall not be interpreted so as to reduce the total number of lots permitted. Within the total area of any planned residential development, a minimum of 30% shall be undisturbed open space. Such undisturbed open space must be designed to comply with § 400-56E of this part and should be located so as to maximize protection of "natural features" as set forth in § 363-16 of the Natural Resources Ordinance. Borough Council shall have the right to approve the location of all undisturbed open space. The application for tentative approval covers the entire planned residential development and shows the location and approximate time of construction for each stage in addition to other information required by this chapter. At least 15% of the dwelling units in the plan given tentative approval are included in all but the final stage. The second and subsequent stages are completed consistent with the tentatively approved plan and are to the satisfaction of Council of such size and location, including a sufficient degree of completion of the road network and other infrastructure, that they constitute economically sound units of development. Each phase shall include undisturbed open space in amounts and at locations deemed acceptable by the Council to assure protection of the sensitive features of the tract. Gross residential density may be varied from stage to stage, provided that final approval shall not be given to any stage if the gross residential density of the area which includes stages already finally approved and the stage for which final approval is being sought exceeds by more than 20% the gross residential density allowed for the entire planned residential development in the tentatively approved plan. The layout of any planned residential development shall be consistent with the Borough Plan. Dwellings, roads, parking areas, other structures and facilities, and common open space areas, all shall be located, oriented and dimensioned to comply with the Borough's Natural Resources Ordinance (Chapter 363, Part 2). There shall be four off-street parking spaces, two of which must be enclosed, each measuring 9 1/2 feet by 18 feet for each dwelling unit. Each parking space for physically disabled persons shall have minimum dimensions of 12 feet by 19 feet. Any common parking area may contain a maximum of 40 parking spaces. Parking areas shall be at least 20 feet from all structures, 50 feet from any PRD tract boundary, and shall be designed so that through traffic between parking areas shall be prevented. All open parking areas shall be improved with an all-weather dust-free surface. Common parking areas shall be provided with islands that are mounded and landscaped in conformity with the Grounds Maintenance Guide such that no more than five spaces occur within a row. Further, such parking areas shall be adequately screened in accordance with the terms of § 400-73 of this part. Driveways or roads serving dwellings. No driveway across public property or curb shall exceed a width of 25 feet. Lots having less than 175 feet frontage at the right-of-way line of any road or lane shall have no more than one entrance onto said road or lane. Sections 380-18D, 380-19, 380-20, 380-23 and 380-24 of Chapter 380, Subdivision and Land Development, shall apply to planned residential developments. If water is to be provided by means other than by private wells owned and maintained by the individual owners of lots within the planned residential development, applicants shall present evidence that the planned residential development is to be supplied by a certificated public utility, a bona fide cooperative association of lot owners, or by a municipal corporation, authority or utility. A copy of a certificate of public convenience from the Pennsylvania Public Utility Commission or an application for such certificate, a cooperative agreement, or a commitment or agreement to serve the area in question, whichever is appropriate, shall be acceptable evidence. Signs, vision obstruction, walls and fences, boats and mobile homes, and swimming pools. The provisions of §§ 400-22 to 400-27 of this chapter shall apply to planned residential development. Incidental recreational facilities. No incidental recreational facilities which are not structures shall be located closer than 15 feet to any boundary of the planned residential development, any structure or any proposed public street right-of-way, nor closer than 40 feet to the center line of any existing or proposed private road within the planned residential development serving more than three dwellings. Incidental recreational facilities which are structures shall comply with § 400-71 below. Within a PRD, no building or structure shall be located closer to any boundary than the greater of: 1) 100 feet; or 2) in a PRD made up of detached single-family dwellings, the required rear yard setback is 60% of the individual width; or 3) in a multifamily PRD, 2.5 times the building height. Borough Council may, at its sole discretion, reduce the required perimeter setback when the PRD abuts Borough parkland or another PRD. The total building coverage shall not exceed 10% of the total site area. The maximum permissible height of building shall be three stories or 40 feet, whichever is less. No building shall have a continuous exterior horizontal surface larger than 50 feet in any direction without a surface setback of at least five feet. No building shall have an overall horizontal dimension greater than 200 feet. Lots on a curve: the distance between two lines which extend perpendicularly from a line drawn between the two lot lines intersecting the right-of-way to the outermost points of the building. All dwellings shall comply with the minimum area and bulk requirements specified below. Each side setback: the greater of 30 feet or 45% of the individual building width. Front setback: the greater of 50 feet or 60% of the individual building width. Rear setback: the greater of 40 feet or 60% of the individual building width. Lot size: 10,000 square feet minimum per dwelling unit. Front setback: the greater of 50 feet or 15% of the total building width, except that the setback can be reduced at the discretion of the Borough Council on lanes. Rear setback: the greater of 40 feet or 35% of total building width. Net density of development of fourplex and/or townhouse structures shall not exceed the lesser of eight dwelling units per acre or the densities determined by §§ 400-69A and 400-71F(1). Width: Townhouse units shall not be less than 20 feet in width. Front setback: the greater of 50 feet or 25% of the total building width. Rear setback: the greater of 40 feet or 50% of the total building width. Distance between structures: No residential structure shall be situated less than the greater of 40 feet or 150% of the total average building height from any other residential structure. Distance of dwellings from solid waste collection stations, parking areas and access roads thereto (except driveways): the greater of 20 feet or 25% of the total building width. Net density of development of apartments shall not exceed the lesser of 12 dwelling units per acre or the densities determined by §§ 400-69A and 400-71F(1). Front setback: the greater of 50 feet or 20% of the total building width. Distance between structures: No apartment structure shall be situated less than the greater of 40 feet or 150% of the individual building height from any other residential structure; specific requirements are associated with each of the various methods. Distance of dwellings from solid waste collection stations, parking areas and access roads thereto (except driveways): the greater of 20 feet or 15% of the total building width. 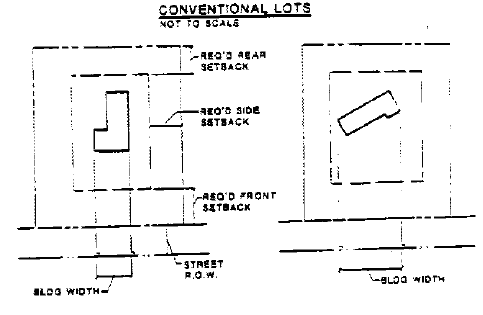 Corner lot setbacks: When any structure or dwelling as set forth in Subsections F(1) through (4) of this section abut or border more than one street, road or lane, then the applicable setbacks shall be determined using a front setback for each yard abutting or bordering such street, road or lane and a rear setback for each other yard. A maintenance agreement acceptable to the Borough is reached. The Borough agrees to and has access to maintain such lands. Homeowners' association. The common open space may be held in common ownership by a homeowners' association. This method shall be subject to all of the provisions for homeowners' associations set forth in § 400-72B below, and the homeowners' association agreement shall be recorded. Where undisturbed open space is held in ownership by a private individual, covenants shall prohibit disturbance of such open space. Condominium agreements. The common open space may be controlled through the use of condominium agreements. Such agreements shall be in conformance with the Uniform Condominium Act of 1980. All open space land shall be held as "common element." The developer shall provide to the Borough a description of the organization, including its bylaws and documents governing open space maintenance and use restrictions, particularly as relates to undisturbed open space. The organization shall be established by the developers and shall be operating (with financial subsidization by the developers, if necessary) before the sale of any lots within the development. Membership in the organization is mandatory for all purchasers of homes therein and their successors. The developer of any subdivision or land development proposed to contain an area(s) of common open space shall arrange with the County Board of Assessment a method of assessment of the open space which will allocate to each tax parcel in the subdivision a share of the total assessment for such open space. Where this alternative is to be utilized, the method of allocation shall be approved by the Council. The members of the organization shall share equitably any costs of maintaining or developing common open space in accordance with the procedures established by them and consistent with the terms of this part. In the event of any proposed transfer of common open space land by the homeowners' association within the methods permitted, or of the assumption of maintenance of common open space land by the Borough as hereinafter provided, notice of such action shall be given to all property owners within the planned residential development by the homeowners' association. The organization shall have or hire staff, as necessary, to administer common facilities and maintain open space. The homeowners' association may lease back open space lands to the developer or to any other person or corporation qualified to manage open space for operation and maintenance of open space lands, but such a lease agreement shall provide: a) that the planned residential development shall at all times have access to the open space lands contained therein; b) that the common open space to be leased shall be maintained for the purposes set forth in this part; and c) that the operation of open space facilities may be for the benefit of the residents of the planned residential development only or may be open to the residents of the Borough. The lease shall be subject to the approval of the Borough, as shall any transfer or assignment of the lease. Lease agreements so entered upon shall be recorded with the Recorder of Deeds of Allegheny County within 90 days of their execution, and a copy of the recorded lease shall be filed with the Borough. Design and characteristics of common open space. Shall otherwise not be maintained except to remove undesirable plants and to assure that streams are kept in a free-flowing condition. No replanting shall occur within areas of undisturbed common open space except in consultation with the Environmental Advisory Council and in accordance with the recommendations of the Grounds Maintenance Guide. In addition to the minimum amount of undisturbed common open space, other portions of the tract may be designated and developed for active recreation, including but not limited to tennis, swimming, play fields and tot-lots. The tentative and final plans shall designate such intended uses, the type of maintenance to be provided, and a planting plan or schedule. Such areas shall be located and maintained so as not to create a hazard or nuisance. Made subject to such agreement with the Borough and such deed restrictions duly recorded in the office of the Recorder of Deeds in Allegheny County as may be required by the Council for the purpose of preserving the common open space for such use. In the event that the organization established to own and maintain a common open space, or any successor organization, shall at any time after establishment of the planned residential development fail to maintain the common open space in accordance with the development plan, the Borough may serve written notice upon such organization or upon the residents and owners of the planned residential development, setting forth the manner in which the organization has failed to maintain the common open space in reasonable condition, and said notice shall include a demand that such deficiencies of maintenance be cured within 30 days thereof and shall state the date and place of a hearing thereon, which shall be held within 14 days of the notice. At such hearing the Borough may modify the terms of the original notice as to the deficiencies and may give an extension of time within which they shall be corrected. If the deficiencies set forth in the original notice or in the modifications thereof shall not be corrected within said 30 days or any extension thereof, the Borough, in order to preserve the taxable values of the properties within the planned residential development and to prevent the common open space from becoming a public nuisance, may enter upon said common open space and maintain the same for a period of one year. Said entry and maintenance shall not constitute a taking of said common open space and shall not vest in the public any rights to use the common open space except when the same is voluntarily dedicated to the public by the residents and owners, and such dedication is acceptable to the Borough. Before the expiration of said year, the Borough shall, upon its initiative or upon the request of the organization theretofore responsible for the maintenance of the common open space, call a public hearing upon notice to such organization or to the residents and owners of the planned residential development, to be held by the Borough, at which hearing such organization or the residents and owners of the planned residential development shall show cause why such maintenance by the Borough shall not, at the election of the Borough, continue for a succeeding year. If the Borough shall determine that such organization is ready and able to maintain said common open space in reasonable condition, the Borough shall cease to maintain said common open space at the end of said year. If the Borough shall determine such organization is not ready and able to maintain said common open space in a reasonable condition, the Borough may, in its discretion, continue to maintain said common open space during the next succeeding year and subject to a similar hearing and determination in each year thereafter. The decision of the Borough in any case shall constitute a final administrative decision subject to judicial review. The cost of such maintenance and enforcement proceedings by the Borough shall be assessed ratably against the properties within the planned residential development that have a right of enjoyment of the common open space and shall become a lien on said properties. Said assessment or charges shall be subordinate in lien to the lien of any prior mortgage or mortgages on the property which is subject to such assessments or charges. The Borough, at the time of entering upon such said common open space for the purpose of maintenance, shall file a notice of such lien in the office of the Prothonotary of the County upon the properties affected by such lien within the planned residential development. When the site is contiguous to any public right-of-way for which planting recommendations are made in the Grounds Maintenance Guide, the developer shall follow those recommendations. Along other existing and proposed roads serving more than three dwellings, plantings shall be installed in conformity with the species, types of arrangements, sizes and types of locations recommended by the Grounds Maintenance Guide. Screening shall be provided by the developer such that at least 50% of the visible area of each proposed building (including 100% of all garage doors) and 100% of each proposed open parking area and all possible automobiles within it shall be hidden from view from any adjoining property or existing adjoining road. With respect to adjoining roads, such views shall be based upon the viewer's location at the far edge of the road cartway, the opposite edge of which directly abuts the tract. With respect to adjoining properties, the viewer's location shall be along the lines established by the minimum front, side and rear yard distances as required by existing zoning for those properties. Screening shall be by existing vegetation or topography, evergreen plantings, earth berms, changes in grade or walls. Where screening is proposed to be by evergreen plantings, the species, types of arrangements, types and locations and minimum sizes shall conform with the Grounds Maintenance Guide, shall meet 50% of each applicable screening requirement at the time of installation, and shall be capable of meeting 100% of each applicable screening requirement at the ultimate expected size listed in standard horticultural references. All existing trees two inches or more in dbh and/or six feet or more in height shall be preserved, except when cutting thereof is specifically approved by the Council or is necessary for ensuring adequate sight distance. The amount, density and types of plantings shall be based upon physiographic features, feasibility of using native species, proximity to existing dwellings, compatibility of adjacent uses, and natural views. In areas where the physiographic features and existing vegetation provide an attractive setting, the planting strip requirement shall be met by such natural conditions. No planting shall be placed with its center closer than five feet from a property line of the tract. Planting species shall be mixed; generally, a minimum of 25% shall be evergreen and 10% flowering material. Plantings shall be permanently maintained and, if necessary to maintain an effective screen, replaced in the event they become diseased or dead. All common parking areas, steps, ramps, walkways of high pedestrian use, and directional signs shall be adequately lighted. Council may require lighting in other areas for reasons of public safety. All above required lighting and all external lighting fixtures appurtenant to a structure shall be shielded from all residential properties and from all rights-of-way so as to eliminate light glare beyond an angle of 35° from a vertical plane. No such lighting shall exceed 20 feet in height.